The archosaurs underwent a major phase of evolutionary diversification at the end of the Early Triassic. They branched into two major groups, one of which led to the crocodilians and the other to the dinosaurs and birds. The precise compositions of these two lineages were hard to resolve (Gauthier, 1986; Benton and Clark, 1988; Sereno, 1991; Gower and Wilkinson, 1996; Benton, 1999a), as there were a large number of convergences, particularly in modifications of the limbs and changes in posture (see Box 6.2). The current view (Gower and Wilkinson, 1996) is that the crocodilian lineage, the Crurotarsi, includes most of the Late Triassic archosaurs, whereas the dinosaur lineage, the Ornithodira (see p. 153), includes dinosaurs, pterosaurs and a number of basal forms (see cladogram). 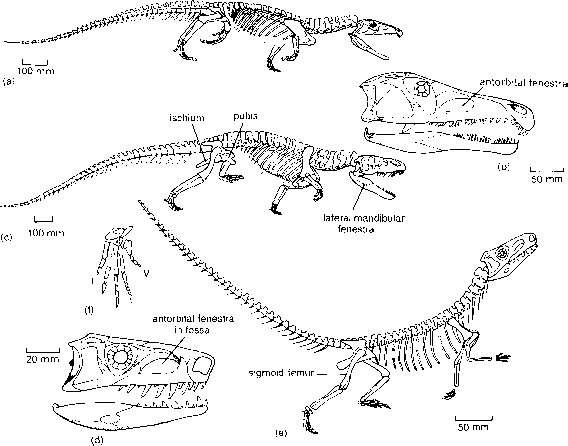 Note that I use the term 'Archosauria' to refer to the whole clade, the normal usage, whereas some authors (e.g. Gauthier, 1986) have suggested restricting the term to the clade termed Avesuchia here. 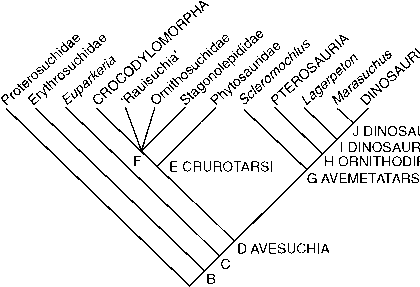 In the cladogram, the key contentious issues have been the placement of Euparkeria and of the ornithosuchids and the relationships of rauisuchians. On the basis of the structure of the ankle, Euparkeria was assigned by Gauthier (1986) to the dinosaur lineage, but these characters are outweighed by features of the derived archosaurs that are absent in Euparkeria (Benton and Clark, 1988; Sereno, 1991; Gower and Weber, 1998). Benton, 1999a), however, have shown that they are part of the Crurotarsi. Relationships within Crurotarsi are still uncertain. Phytosaurs appear to be the basal branch (Sereno, 1991), although only just (Benton, 1999a), but the relationships among ornithosuchids, stagonolepidids, rauisuchians and crocodylomorphs have so far defied analysis (Benton, 1999a). Cladogram showing the relationships of the Triassic archosaurs, based on the work of Gauthier (1986), Benton and Clark (1988), Sereno (1991), Parrish (1993), Sereno etal. (1993), Gower and Wilkinson (1996) and Benton (1999a). See Figure 6.6 for context of Archosauria; see Box 8.5 for relationships of Dinosauria and Box 8.8 for more detail on crocodylomorph and pterosaur relationships. Synapomorphies: A ARCHOSAURIA, antorbital fenestra in snout wall between nostril and orbit, laterally flattened teeth with serrations, ossified laterosphenoid in braincase, lateral mandibular fenestra in posterior lower jaw bones, B, antorbital fossa surrounding the fenestra, pubis and ilium elongated, anterior process on iliac blade, fourth trochanter on femur, canal between astragalus and calcaneum absent, distal tarsals 1 and 2 not ossified, metatarsal 3 longer than 4; C, parietal foramen absent, sigmoid (S-shaped) curvature of shaft of femur, osteoderms (bony plates) running along the back; D AVESUCHIA, loss of palatal teeth, calcaneal tuber oriented more than 45° posterolaterally, continuous articular surfaces for fibula and distal tarsal 4 on calcaneum; E CRUROTARSI, cervical ribs short and stout, scapulocoracoid notch at anterior junction of scapula and coracoid, ventral astragalocalcaneal articular facet large, astragalar tibial facet flexed, calcaneal tuber shaft broader than tall, calcaneal tuber distal end rounded, hemicylindrical calcaneal condyle, osteoderm sculpture; F, pubic acetabular margin posterior portion recessed, calcaneal tuber distal end with dorsoventrally aligned median depression; G AVEMETATARSALIA, forelimb/hindlimb ratio less than 0.55, pubis longer than ischium, tibia/femur ratio more than 1.0, distal tarsal 4 subequal in transverse width, to distal tarsal 3, compact metatarsus with metatarsals I—IV tightly appressed, metatarsals II—IV more than 50% tibial length, absence of dorsal body osteoderms; H ORNITHODIRA, presacral centrum 8 longer than presacral centrum 18, deltopectoral crest on humerus subrectangular, fibula tapering and calcaneum reduced in size, astragalar posterior groove and calcaneal tuber rudimentary or absent; I DINOSAUROMORPHA, subrectangular and distinctly offset femoral head, astragalar ascending flange on anterior face of tibia, astragalar anteromedial corner acute, calcaneal distal articular face less than 35% of that of astragalus, articular facet for metatarsal V less than half of lateral surface of distal tarsal 4, midshaft diameters of metatarsals I and V less than 11—IV, metatarsal V has no 'hooked' proximal end and articular face for distal tarsal 4 is subparallel to shaft axis; J DINOSAURIFORMES, parallelogram-shaped cervical centra, acetabular antitrochanter, articular surface on the femur that extends under the proximal head, weakly developed lesser (anterior) trochanter on the femur. The Early Triassic archosaurs took over the carnivorous niches formerly occupied by the gorgonopsids and titanosuchids that had died out at the end of the Permian. Proterosuchus (Figure 6.2(a, b)) from South Africa (Cruickshank, 1972) shows four archosaurian hallmarks: an antorbital fenestra (an opening in the side of the skull between the nostril and the eye socket that housed an air sinus), an ossified laterosphenoid (a midline structure in front of the braincase), a lateral mandibular fenestra (an opening in the side of the lower jaw) and flattened (instead of rounded) teeth. Proterosuchus is a slender animal 1.5 m long that probably preyed on small and medium-sized synapsids (therocephalians, dicynodonts) and procolophonids. It has short limbs and adopted a sprawling posture, as in most Permian synapsids and living lizards and salamanders. In the Early and Mid-Triassic, further basal archosaur lineages flourished for a short while. The erythrosuchids, such as Vjushkovia from Russia (Figure 6.2(c)), reached very large size, up to 5m long. These powerful animals were top predators, capable of feed ing on the bulky dicynodonts and other herbivores. Typical archosaur characters that are seen in erythro-suchids and later archosaurs, but not proterosuchids, include a three-pronged pelvis, with an elongate pubis and ischium, a knob-like muscle attachment on the femur, termed the fourth trochanter, and metatarsal 3 longer than 4 (Gower,2003). A small archosaur from the early part of the Mid-Triassic of South Africa heralds the beginning of the first major radiation of the archosaurs. Euparkeria (Ewer, 1965), only 0.5 m or so in length (Figure 6.2(d-f)), may have been capable of walking both on all fours and bipedally. It has a short, high-snouted skull with a large antorbital fenestra set in a pit, and large orbits and temporal fenestrae. It shows features in the skeleton such as an S-shaped femur, and osteoderms,or bony dermal plates down the middle of the back, that place it close to the common ancestry of crocodilians and birds (Gower and Weber, 1998; Box 6.1). 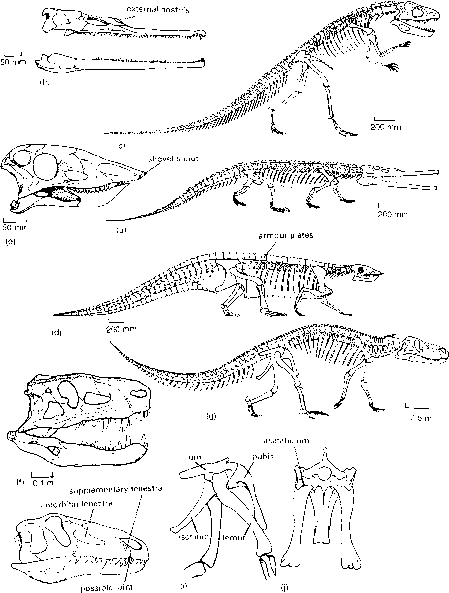 The crurotarsans, members of the 'crocodilian line' of archosaur evolution, are characterized by an ankle joint that allows rotation between the astragalus and calca-neum (Sereno, 1991). The basal crurotarsans, the phy-tosaurs, are known mainly from the Upper Triassic of Germany (Hungerbuhler, 2002) and North America. Parasuchus from India (Chatterjee, 1978) is 2.5 m long and exhibits crocodilian-like adaptations to fish-eating (Figure 6.3(a,b)). The long narrow jaws are lined with sharp teeth that interlock in such a way that Parasuchus could seize a rapidly darting fish and pierce it with the long teeth, and then hold it firm while it expelled water from the sides of its mouth before swallowing. The nostrils of Parasuchus are raised on a mound of bone just in front of the eyes (not at the tip of the snout as in crocodilians), so it could have lain just below the surface of the water with only its nostril-mound showing. Parasuchus,like many modern crocodilians, did not only hunt fishes in the water. Two specimens of Para-suchus have been found with stomach contents of small tetrapods—the bony remains of prolacertiforms and a small rhynchosaur—that may have been seized on the river bank and dragged into the water. Phytosaurs fed on larger prey too: isolated teeth have been found around skeletons of prosauropod dinosaurs on which they may have been scavenging (Hungerbuhler, 1998). The ornithosuchids are known from the Upper Triassic of Scotland and South America. They include forms such as Ornithosuchus (Walker, 1964), which ranged in length from 0.5 to 3.0 m (Figure 6.3(c)).It has a slender build and long hindlimbs that were probably adapted for both quadrupedal and bipedal progression. Superficially Ornithosuchus looks dinosaur-like, but it has the crurotarsan ankle, as well as numerous other characters of that clade (see Box 6.1). The aetosaurs (Stagonolepididae) were the first herbivorous archosaurs, and they radiated nearly worldwide in the Late Triassic (Harris et al., 2003). Stagonolepis from Scotland (Walker, 1961) is up to 2.7 m long with a small head, a powerful heavy tail and short stout legs (Figure 6.3(d, e)).The snout is blunt and upturned and it may have been used to dig around in the soil for edible tubers and roots. The body is encased in an extensive armour of heavy bony plates that are set into the skin, a necessary defence against the major carnivores of that time, the rauisuchians. The rauisuchians are large Late Triassic carnivores, some quadrupedal and some possibly bipedal, referred to the Prestosuchidae, Rauisuchidae, Poposauridae and Chatterjeeidae. Relationships among these forms are unclear: Rauischia may be a clade, or it may be a para-phyletic group that includes ever-closer outgroups to Crocodylomorpha (Benton and Clark, 1988; Gower, 2002). The poposaurid Postosuchus (Figure 6.3(f)), a 2- to 5-m-long carnivore from Texas, USA (Long and Murry, 1995), was a top predator, with a high skull and deep jaws lined with long recurved teeth. The skull was narrow from side to side, and in many ways it is superficially similar to the skull of a carnivorous theropod dinosaur (see p. 155).